If you’re tired of paying big bills for lots of cable- or satellite-TV channels that you never watch, there may be an alternative using a very modern version of an old-fashioned device—an indoor antenna that captures high-definition, over-the-air digital broadcast signals for free. The picture quality from these antennas is equal or superior to the quality of cable or satellite-TV. The mix of channels may include affiliates of major broadcast networks such as ABC, CBS, Fox, NBC and PBS…Spanish-language channels…home-shopping channels…and channels featuring old programs or movies. Indoor HDTV antennas, which are placed on a wall near each TV and connect to the TV with a coaxial cable, typically range from $20 to $80,* and then you pay no monthly fee. (In contrast, a bare-bones cable package with local programming can cost $240 annually.) You need to live no farther than 25 to 60 miles from a broadcast transmission tower, depending on impediments near your home that could compromise reception, such as mountains or tall buildings, and the sensitivity of your antenna. In some locations, an indoor HDTV antenna won’t receive strong enough signals, so your first step is to check which channels you can get by typing in your address at TVFool.com and/or AntennaPoint.com. If the sites indicate that you can get the channels you want, choose an antenna with a range capability based on how far you are from a broadcast tower, which is indicated on these websites. Antennas with built-in amplifiers boost signal strength—extra insurance that you’ll be able to view the channels you want. But make sure that you buy an antenna from a retailer with a no-hassle return policy because reception can vary even from home to home. You may need a rooftop HD antenna instead, which typically costs $100 to $200 or more and requires professional installation. Also decide whether you want to supplement your HDTV broadcast channels with programming from the Web. For example, if you want a wider selection of shows and movies and have an Internet connection, subscribe to Netflix or Hulu for about $8 to $12 a month or Amazon Prime for $99 a year. 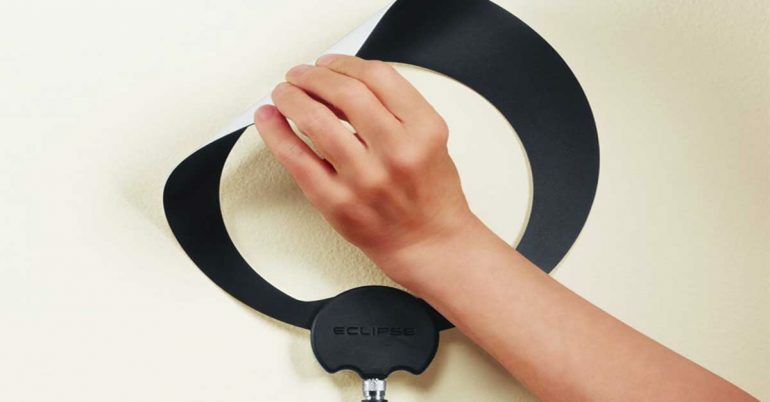 Antennas Direct ClearStream Eclipse Amplified Antenna, which has an attractive elliptical shape, can receive signals within a 50-mile radius and has “sure-grip” backing that allows it to easily stick to a wall or window without tape or nails. Cost: $60. RCA Amplified Ultra-Thin HDTV Antenna, which has a blocky rectangular shape but gives you a 60-mile reception radius and captured the most channels of any antenna I tested. Cost: $60.